Al Brown proposed a discussion to assist Luton Culture in identifying the subject matter of a small work on copper, which appeared to depict a blind woman being offered a pair of eyes on a plate. The piece had ‘Roscoe, Liverpool’ on the back. The artist attribution was to a ‘W. Roscoe’ – and the acquisition details noted that the painting came as part of a large bequest of objects. Was it possible that the ‘Roscoe, Liverpool’ referred to William Roscoe (1753–1831), historian, writer and patron of the arts? Jeffares’ Dictionary of pastellists before 1800 notes William Roscoe, though ‘trained in the “laborious and distasteful profession” of an attorney… was more interested in literature and the arts.’ He was elected as a Liverpool MP in 1806, and is recorded as having produced an ink drawing and pastel work. Could he be the artist of the work in question? It was noted by Richard Green that the note ‘Roscoe, Liverpool’ most likely referred to the previous owner of the artwork rather than the artist. The work looks Italian, perhaps late seventeenth century, or eighteenth century: the subject matter and copper support are rare for British art. Tim Llewellyn concluded it to be the work of an Italian artist, probably Roman, of the early years of the eighteenth century. The subject matter proved straightforward to identify. Pieter van der Merwe offered the subject to be most likely Saint Lucy (Santa Lucia of Syracuse, martyr): the later legend being that she plucked out her own eyes in response to an impatient lover who praised their beauty. 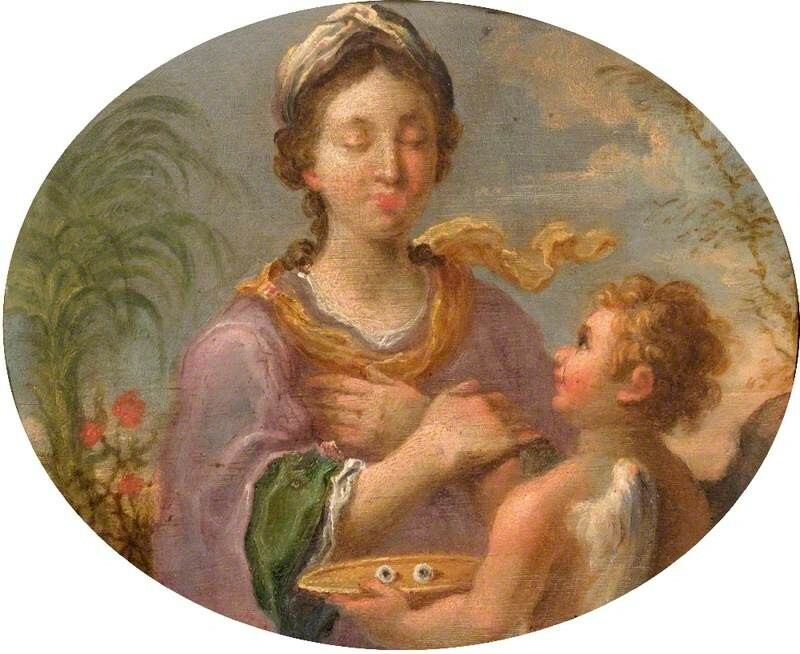 The eyes are usually shown in a dish, ‘and the putto might be an allusion to Cupid in that connection. She also often carries a martyr's palm, here shown to the left.’ Kieron Coutts added that there is a fifteenth-century image of Saint Lucy in Washington featuring a martyr’s palm and eyes on a stem. 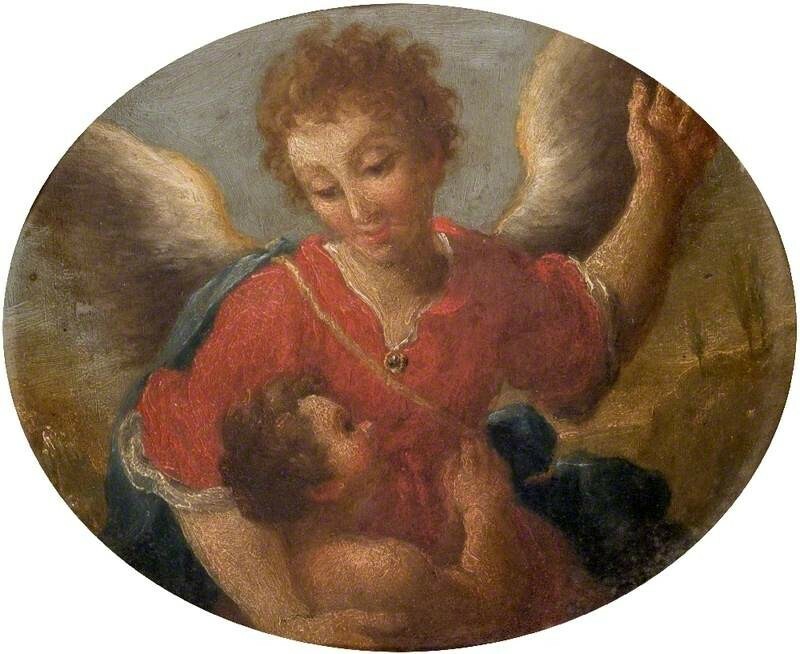 It has been noted that this discussion also affects the work’s companion piece, Angel Showing a Small Child the Way to Heaven by W. Roscoe, as it has been shown that it’s likely W. Roscoe was the donor. 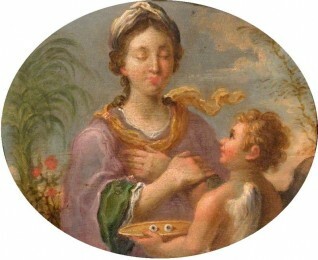 Interestingly, Letizia Treves indicated that ‘it's pendant, showing Tobias and the Archangel Raphael, also relates to blindness: Raphael instructed the young Tobias to use the gall from the fish he caught to cure his father's blindness (Old Testament Book of Tobit).’ PCF are currently in discussion with Luton Culture to determine if a new discussion needs to be created about the companion piece, or whether the companion work’s details can be amended without the need for further discussion. Who is the artist and could this be Saint Lucy?